A number of extremist Israeli settlers held two young Palestinian men in Jerusalem, and violently assaulted them, until the police arrived at the scene, and released them. The WAFA News Agency said the two Palestinians suffered various cuts and bruises, and were in shock, barely able to speak. 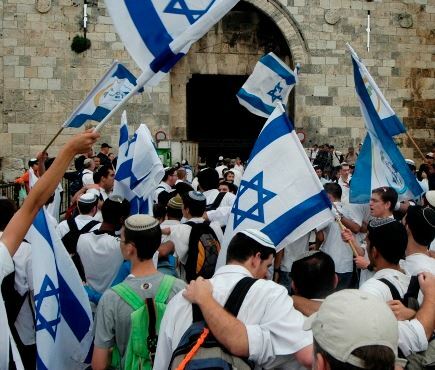 The Israeli Police said the incident took place in Mea Shearim area, and that the attackers were rioting, burnt trash bins, and closed the street before throwing stones at the police while trying to disperse them using water cannons. The Police added that the two Palestinians happened to be walking in the area before the settlers chased them while chanting anti-Arab slogans, and hurled stones at them. Seeking shelter, the two run and to a nearby school where they were surround by the settlers, who proceeded to attack them. The Police then removed the two Palestinians from the area, and released them. A horde of Israeli extremist settlers under military protection on Thursday stormed al-Ishaqiya area, the Muslims’ prayer area at the Ibrahimi Mosque in al-Khalil city. Taysir Abu Sunaina, head of al-Awqaf department in al-Khalil city, said a group of settlers escorted by soldiers forced their way into Muslims’ prayer area known as Ishaqiya following the Isha prayers at night and ruined its carpet with their dirty shoes. 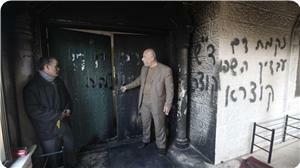 The invading settlers kept performing rituals until they left the Mosque at a late night hour. Abu Sunaina added that the Israeli troops detained the Mosque's guard, noting that the Islamic Awqaf authority had refused on Wednesday a police request to allow settlers to perform rituals at the Muslims' area of the Mosque. Residents of Aqraba town, south east of Nablus, headed to Abu Bakr mosque to offer dawn prayers a couple of days ago, but the flames prevented them from reaching the mosque. Jewish settlers from Itamar settlement destroyed and burned the first floor of the mosque, which is allocated for women, before the residents hurried to put out the fire. Ayman Bani Fadl, the mayor of Aqraba town, said: "Unlike other mosques, the targeted mosque is located away from the town, making it an easy target for the settlers". The Ministry of Endowments, for its part, estimated the cost of the damage inflicted on the 45-year-old mosque at about 25,000 shekels. In his interview with the PIC, Bani Fadl condemned the failure by Israel to take any deterrent measure against the settlers in spite of the complaints and reports submitted to the occupation through the Palestinian liaison office. He also called on all concerned authorities and human rights organizations to pressure the occupation to stop the settlers’ aggressive practices against Palestinian villagers and their land, mosques, and property. The municipality, in an attempt to protect the mosque, formed a committee of volunteers to guard the mosque, but it wasn't approved by the Palestinian security agencies and thus didn't carry out its job. For his part, Hamza Dereya, a popular resistance activist, considered burning the mosque a part of an integrated Zionist policy against the Palestinian people, land, and property, even holy places and establishments. He added in an interview with the PIC that the Jewish settlers are waging guerrilla warfare targeting the Palestinian citizens in an attempt to instill fear in their hearts and facilitate the occupation of the largest area possible adjacent to the settlements. Dereya pointed out that since the beginning of the olive harvest season this year; the Jewish settlers had cut many olive trees in Aqraba town in addition to assaulting a number of farmers on the third day of Eid Al- Adha and trying to steal their olive harvest. The settlers escalated their attacks against the villages to the south east of Nablus this year, most notably; the burning of Qasra mosque, destroying Kherbit Al-Taweel mosque and burning Abu Bakr mosque. About four months ago, the settlers burned a straw field causing huge damages and losses to their owners in addition to spraying racist Hebrew slogans on the walls. Dozens of Israeli settlers damaged Palestinian-owned water wells in the Khirbet Samra area of the Jordan Valley, a local official said on Wednesday. Aref Daraghma, head of a local village council, told Ma'an News Agency that dozens of Israeli settlers who gathered to celebrate the Jewish holiday of Sukkot damaged more than seven wells in the al-Malah area of Khirbet Samra. The covers of the wells were damaged, and parts of some of the wells were "destroyed," he said, asserting that the settlers' actions were meant to pressure Palestinian residents to leave the area. The Jordan Valley is within the 61 percent of the occupied West Bank under full Israeli military control known as "Area C", Ma'an reports. The area comprises the only contiguous piece of land connecting 227 Palestinian residential communities in areas A and B, as well as about 150,000 Palestinian residents. Every year there are dozens of attacks by Israeli settlers on Palestinians and their property in the occupied West Bank, but these crimes are rarely prosecuted and are often facilitated by Israeli authorities. More than 500,000 Israeli settlers now reportedly live in illegal settlements across the West Bank and East Jerusalem, in direct violation of international law. The incident caught on camera in this video took place on Saturday, October 11, 2014, near Mitspe Yair illegal Israeli settlement outpost, in the South Hebron hills, in the Hebron district in the southern part of the occupied West Bank. A number of right-wing Israeli settlers were attacking Israeli peace activists, and pushing them away. The peace activists are with Ta'ayush (Coexistence), an organization of Israeli and Palestinian peace activists nonviolently opposing the occupation of Palestine, and working for full civil equality. 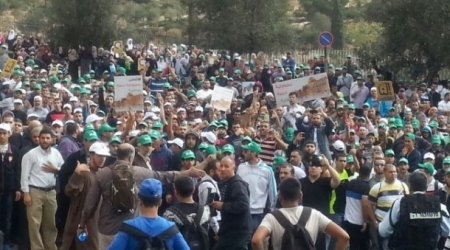 The Ta’ayush activists were accompanying Palestinians from Awad and Jabareen families to their lands, close to the illegal Israeli outpost, where right-wing settlers frequently assault them. The attack took place in front of Israeli soldiers who were at the scene, watching the settlers attack the Israeli peace activists. The soldiers did not do anything to prevent the attack, and Israeli police officers were also deployed nearby – but they, too, did nothing to stop the attack. 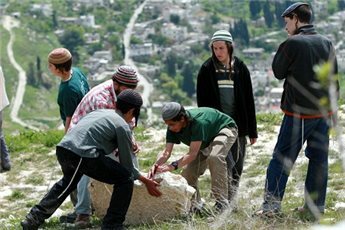 Ta’ayush said the soldiers, who frequently fail to act to stop settler violence, on this occasion once again refused to stop the attacking settlers, and did not apprehend any of them. Female Israeli Peace Activist: Stay away from me, stay away from me. Activist: Stay away from me. Settler: You stay away from me. Activist: I am not touching you, I am not touching you. Activist: I am not touching you. Settler: I will push you! Activist: (Yelling to the soldiers) Excuse me he is pushing me. Activist: You attacked me last time, and you are not going to attack me again. Settler: They [activists] should go; we are sick of this already. Settler: I will close your camera as much as I want. Activist: Let go of me, Let go of me. Voice off camera: Enough, enough. Someone yelling off camera to the soldier: Do your job! Female activist: Stop pushing me. 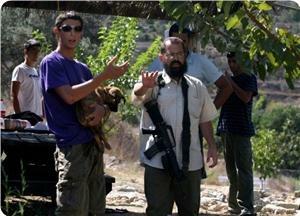 There is violence by settlers here, against Palestinian shepherds, and Israeli leftists. There are soldiers who are seeing everything, in Mitzpe Ya’ir, in the Hebron region. There are police here, up (the hill) that are overlooking the violence, and the soldiers are right there and are not doing anything. So, I am asking to please urgently send the Police here. Urgently send police here. Activist shouting again: Leave me alone. Cameraman: The soldiers here are not doing their job, people are attacking us. Soldiers: Can you please go back a little bit? Settler yelling in the background: Ashkenazi! (referencing a stereotypical stigma in Israeli society about white western European, leftist Jews) Of course I am going to push. Settler: Of course I am attacking you, this is my land. Why would I not attack you? Female activist: This is not your land. Settler: It is my land; it is my father’s land. 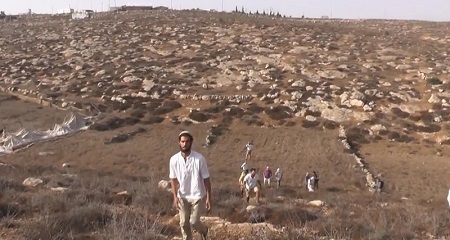 Camera then moves to two settlers attacking an activist, with the soldiers behind the settlers. A voice off-camera says: Soldiers look here, soldiers look here, please pay attention to what is happening here. Female activist: Please stay away from me. Israeli extremists settlers stormed Wednesday morning al-Aqsa Mosque through al-Magharba gate under Israeli police protection, a number of Palestinian worshipers were injured by Israeli police. Director of Media at Al-Aqsa Foundation for Waqf and Heritage Mahmoud Abu Atta said that 50 settlers stormed al-Aqsa mosque at 7:30 accompanied by a number of rabbis distributed on two groups, and organized a short tour in different parts of its yards. He mentioned that Israeli forces kept the Mosque’s gates closed, banning Palestinian worshipers’ access to its courtyards. Women of all ages and men under the age of 50 are prevented from entering into the mosque. He explained that Israeli occupation police based at the mosque gates and imposed special measures to prevent worshipers from entering al-Aqsa mosque. 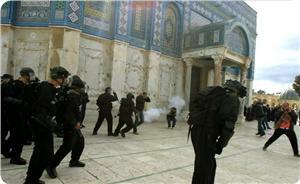 Groups of extremist Jewish settlers, often accompanied by Israeli security forces, repeatedly stormed Al-Aqsa complex. The frequent violations anger Palestinian Muslims and occasionally lead to violent confrontations. For Muslims, Al-Aqsa represents the world's third holiest site. 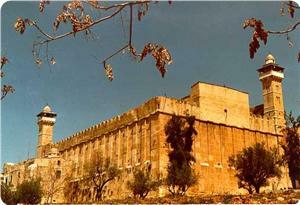 Jews refer to the area as the "Temple Mount," claiming it was the site of two prominent Jewish temples in ancient times. Israel occupied Al-Quds during the 1967 Middle East War. It later annexed the holy city in 1980, claiming it as the capital of the self-proclaimed Jewish state. Tension has been running high at holy al-Aqsa Mosque as dozens of Palestinian peaceful sit-inners on Wednesday sustained critical wounds in a round of arbitrary assaults launched by the Israeli occupation police and settler bunches. Mahmoud Abu Al-Ata, media manager at the Aqsa Foundation for Endowment and Heritage, told Al-Ray news agency that many of the hundreds of Jerusalemites and Palestinians of the 1948 occupied Palestine, who gathered at the downtown street near Bab al-Asbat and Bab Hatta in an attempt to foil the settlers’ sacrilegious break-ins, were left wounded. At least 50 Israelis, divided into two settler flocks, stormed Muslim’s holy al-Aqsa Mosque as early as 7.30 a.m. and defiled its courtyards. The Israeli policemen had earlier tightened grips on Occupied Jerusalem and cordoned off all of al-Aqsa gates, denying Palestinians below the age of 50 and women access into the Mosque to perform their religious prayers within. Israeli fanatic rabbis and leaders stepped up calls for desecration attacks against al-Aqsa under pretext of the advent of the so-called Israeli sukkot holiday. Analysts said the campaign manifests of Israel’s attempt to enforce spatio-temporal division and impose a fait accompli on the Mosque. A wave of violent confrontations flared up between the Israeli occupation apparatuses and a group of Palestinian unarmed youths as a result. Eyewitnesses documented heavy discharge of random barrages of tear gas on the Palestinian youngsters and civilian homes in al-Tur neighborhood, the Shua’fat refugee camp, and the Qalandia crossing, among other neighborhoods. At least 20 Palestinian civilians, including a child and a woman, have been nabbed by the Israeli occupation police throughout the mass-abduction campaign that suddenly rocked Occupied Jerusalem. Meanwhile, the High Follow-up Committee for the Arab masses in 1948 occupied Palestine has launched distress signals over the ferocious sacrilegious campaign targeting the sanctity of al-Aqsa and Occupied Jerusalem, calling on Arabs and Muslims to head to the Mosque en masse on Wednesday. The call comes at a time when Jerusalem’s Grand Mufti Sheikh Mohamed Hussein, who partook in the mass-rallies staged at al-Aqsa, urged Muslims to intensify their presence at the Mosque. Along the same line, the ministry of information called on all mass media and news reporters to join the sit-ins so as to broadcast an authentic coverage of the scene and pressure the international community to immediately step in and take serious action against Israel’s flagrant breaches of international laws and Muslims’ rights. Meanwhile, Hundreds of buses loaded with Muslim worshippers headed to al-Aqsa at dawn on Wednesday to maintain vigil at the Mosque and thwart Israeli break-ins. Local media sources said the Israeli occupation soldiers denied the buses access into al-Aqsa Mosque and its vicinities, forcing all those who managed to mush their ways through the barriers out of the area. The sit-inners have been performing pro-Muslim chants and slamming the apathy maintained by the Arab and international community’s vis-à-vis Israel’s mounting terrorism against such a historically Islamic site. In a related development, the Israeli minister of internal security and the commander in chief of the occupation police have been deliberating over ways to step up monitoring of young Muslim worshippers via drones and military tactics, the Israeli Channel 2 reported Tuesday. Expert in Jerusalem’s affairs and illegal Israeli settlements, Dr. Jamal Amr, spoke out against Israel’s pre-planned attacks on Muslim’s holy al-Aqsa and its supervising personnel, dubbing them unprecedented campaigns that have crossed all red lines ever since Jerusalem was occupied in 1967. Jerusalemite expert Jamal Amr told the PIC: “The Israeli occupation police and extremist settlers have heavily beaten up the director of al-Awqaf personnel, Azzam al-Khatib, and the director of holy al-Aqsa Mosque, Sheikh al-Kiswani, along with a number of guards, before nabbing them all. Muslims’ holy al-Aqsa Mosque has been lately subjected to a round of unprecedented ferocious attacks and sacrilegious campaigns launched by Israeli settler hordes and occupation police. 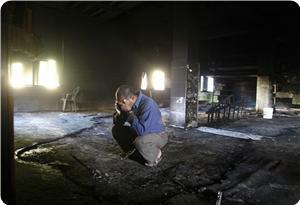 Dozens of peaceful Muslim worshippers and sit-inners sustained critical wounds in the process. This is another chain in the series of Israel’s systematic assaults on the Mosque and Jerusalem’s holy sites, marking a shocking transition from secret aggression to flagrant terrorism, Amr maintained. He called for defending the Mosque against Israel’s vandalism and belligerence perpetrated under the protection of the occupation police and extremist MKs. Israeli settlers at dawn Tuesday set fire to Abu Bakr mosque in Aqraba town, south of Nablus, and sprayed racist slogans and threats on its walls. The PIC correspondent quoted a local activist as saying that the settlers burned the first floor of the mosque that is allocated for women. The damage was discovered when local residents came to offer dawn prayers and they started immediately putting out the fire. Aqraba town was subjected three months ago to a similar attack against an agricultural facility carried out by extremist settlers form Gittit and Itamar settlements. Meanwhile, Israeli Occupation Forces (IOF) stormed at dawn Tuesday different areas of the West Bank and installed a number of makeshift checkpoints. In Jenin, large numbers of Israeli forces stormed the towns of Araba, Qabatiya, Maslia, Zababda, and Mithloun and were deployed throughout Jenin city neighborhoods. Local sources said that Palestinian vehicles were stopped and searched during the raid campaign. No arrests were reported. 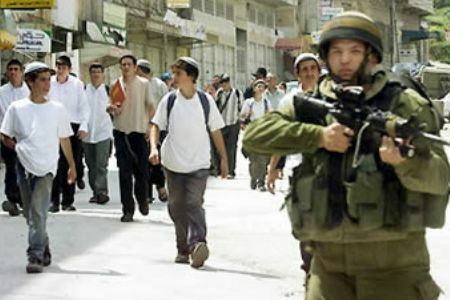 In Nablus, IOF broke into Faraa refugee camp accompanied with police dogs and launched a raid and search campaign into several homes and schools. A number of people were assaulted and investigated during the raids. The soldiers caused a big mess in the raided homes after blowing up its doors. Some family members were detained for long hours in the same room during the searches. On the other hand, IOF stormed Balata refugee camp and Burin town, south of Nablus, amid heavy fire of the sound bombs. Israeli settlers have noticeably increased their attacks against olive fields in Salfit this year in comparison to last year. The Palestinian expert Khaled Maali said that Yassuf town in Salfit has witnessed the highest number of settler attacks against olive trees and Palestinian farmers. The town is expected to witness mass attacks and vandalism campaigns during the olive harvest more than the other towns for being surrounded by an Israeli military camp and settlements, he added. Five settler attacks were reported against local farmers in the town since the beginning of the olive harvest this season, he pointed out. The situation at the Aqsa Mosque and in east Jerusalem are still very tense after Israeli police troops forced their way into the Islamic holy place following the dawn prayers, assaulted Muslim worshipers and then allowed scores of Jewish settlers and right-wing officials to desecrate its sanctity. 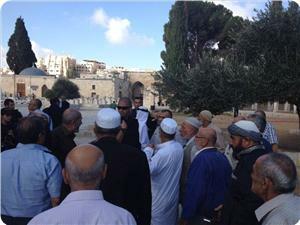 According to the Aqsa foundation for endowment and heritage, deputy Knesset speaker Moshe Feiglin along with four of his entourage toured the courtyards of the Aqsa Mosque compound for about 45 minutes and performed Talmudic rituals at Al-Rahma Gate before he gave a speech about the alleged temple mount outside the Dome of the Rock building. About 190 Jewish settlers and right-wing officials have defiled the sanctity of the Aqsa Mosque since today's morning hours. The Aqsa Mosque has also been under tight siege by the Israeli police, who closed all its gates and entrances, and prevented all its employees and guards as well as Muslim worshipers from entering it before storming it in order to evacuate it for Jewish settlers. In a related development, the high follow-up committee for Arab affairs in the 1948 occupied lands announced that it would release "the document of allegiance to Jerusalem and the Aqsa Mosque" during a massive rally to be held at the Mosque on Wednesday morning. In a press release, the Arab follow-up committee urged the Palestinians in the 1948 occupied lands to actively participate in the rally in support of the Aqsa Mosque. It called on Jordan to exercise its administrative sovereignty over the Aqsa Mosque and also urged the Palestinian Authority to shoulder its responsibilities in this regard. The committee also announced its intention to organize soon a popular conference for the protection of Jerusalem and the Aqsa Mosque. The Israeli Occupation Forces (IOF) continued Monday their arrest campaign throughout the West Bank. 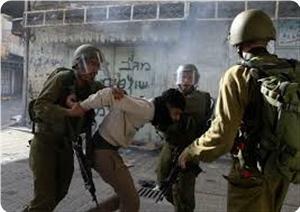 12 arrests were reported in al-Khalil, Jenin, Bethlehem, Nablus, and Jericho. The Palestinian Prisoners Society (PPS) reported that three citizens were arrested in Bethlehem after breaking into their homes, while two others were detained in al-Khalil. In Jenin, three Palestinians were arrested including two brothers and an ex-detainee who spent 12 years behind Israeli bars. In Nablus, two arrests were reported in Balata refugee camp during clashes that erupted when Israeli settlers broke into Yousef tomb. The clashes broke out at dawn Monday between dozens of citizens and Israeli forces who came to provide protection for settlers’ break-in into Yousef tomb to the north of the city. Eyewitnesses said that large numbers of Israeli forces were deployed in the vicinity of the tomb and erected makeshift checkpoints in the area, which led to the outbreak of the clashes. Israeli undercover policemen disguised as Arabs on Sunday evening kidnapped four Jerusalem kids in Shuafat neighborhood, while young men foiled a settler's attempt to kidnap a child in the Old City. Head of the family committee of Jerusalem prisoners Amjad Abu Asab said Israeli policemen disguised as Muslim clerics kidnapped four kids aged between 16 to 17 years in Shuafat neighborhood, northeast of occupied Jerusalem, and took them to an unknown place. In another incident, a Jewish settlers kidnapped yesterday a four-year-old child named Majd Hazina from Al-Saadiya neighborhood in the Old City of Jerusalem before some Palestinian young men were able to save him in Al-Wad neighborhood after chasing the captor a distance of 150 meters. Abu Asab said that the mother of the child identified the settler who kidnapped him after the Israeli police showed her some pictures of suspects. The settler, however, claimed he mixed up the child with another one he had seen a picture of him on a facebook page and thought to take him back to his Jewish family. Abu Asab expressed his belief that the police would release the settler after detaining him for a couple of hours as happened previously in similar incidents.